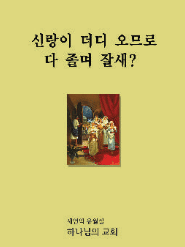 In defending their claims that Ahnsahnghong is divine, members of the World Mission Society Church of God have argued (as noted on numerous sites such as here, here or here) that Ahnsahnghong “revealed the secret of the 7 thunders”. Members of the WMSCOG claim that the 7 thunders in Revelation 10, represent the 7 feasts in the Old Testament (noted on this blog here). When I was a member of the WMSCOG, I took extensive notes on this study because of the importance that high ranking members placed on this “secret”. I was told that “through this study we prove that Ahnsahnghong is god because he is the only one that could unseal the 7 thunders”. To those of you who have never been a member of the WMSCOG, I apologize if your head is spinning right now. I know this is Bible hopscotch. Does The Sound Of Thunder Always Represent God’s Voice? In the above two verses, it is clear that other voices from heaven, not only the voice of God, are described as sounding like thunder. Therefore, the WMSCOG’s claim that the 7 thunders in Revelation 10 must be the voice of God, is not certain since the text does not say it is the voice of God. This is important because if the 7 thunders do not represent God’s voice, then the argument that Ahnsahnghong is god because he “unsealed the secret of the 7 thunders”, or 7 instructions from God, is no longer tenable. This is one possible problem with the study, but there is a far more glaring error–only the Ten Commandments were written on the stone tablets given to Moses which unequivocally refutes point #8 of the study, as we will now demonstrate. Were The Old Covenant Feasts Written On The Back Of The Stone Tablets Given To Moses? 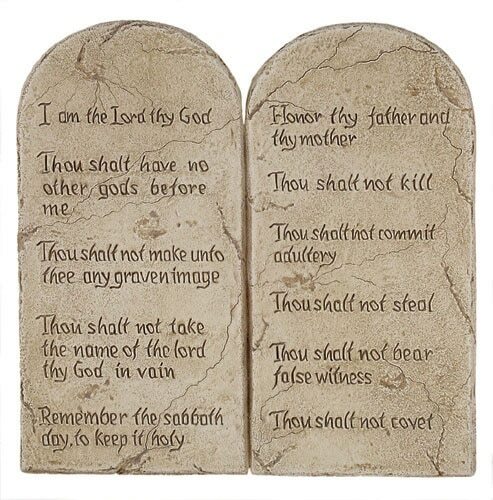 Exodus 34:28 states that only the Ten Commandments were written on the stone tablets. That’s bad news for point #8 of the study outlined above, because that means that the 7 thunders are not the 7 feasts. It gets better. 13 He declared to you his covenant, the Ten Commandments, which he commanded you to follow and then wrote them on two stone tablets. 14 And the LORD directed me at that time to teach you the decrees and laws you are to follow in the land that you are crossing the Jordan to possess. Deuteronomy 10:4 confirms that the writing on the second set of tablets was in fact the same as the first. It is incomprehensible to read the above scriptural proof, and still conclude that there was anything except for the Ten Commandments written on the stone tablets. After concluding that the 7 thunders John heard in Revelation 10 may not have been God’s voice, and that only the Ten Commandments were written on the stone tablets given to Moses, the rest of the WMSCOG’s study becomes irrelevant. I remember believing that the WMSCOG’s studies were perfect when I was a member. At least that’s how they were presented. I remember hearing members say that the Bible never made sense until they had studied with the WMSCOG. Today that statement seems overwhelmingly ironic after seeing other numerous examples of verses the WMSCOG has taken out of context in order to “make sense” of the Bible. good keep it up do more research. Interesting research. Did you also look into how the Church of God received The highes award in England? It’s quite interesting. Read some New Testimate my guy !!! Your ” disproving evidence” is just a full display of your biblical ignorance. You clearly don’t know the difference between the law of Moses and the law of Christ. When Jesus ate the Passover in Marks upper room he established a New covenant that gives life through this his flesh and blood making the covenant entrusted to Moses on mount Sinai obsolete. Read the book of luke since you say “everything’s taken out of context” read the book of Hebrews also, so you can know that Christ had to come a second time not to judge the world but to bring salvation but how can we have salvation if we can’t eat his flesh and blood which is said to give us eternal life? Historical proof shows the Passover that Jesus established was abolished (325AD council of Nica )Which is why Christ came a second time. To bring back the Passover of the new covenant along with the 6 other feast. Not the feasts the physical Israelites or Jews practice, those are pointless in this genertion. No other church has the Passover of the new covenant that gives everlasting life and the 6 feast the Jesus Christ established. Except the church of god , spiritual mount Zion. Read Hebrew for sure. One question I have thought. If you say the seven thruders aren’t commands from god, then what do you say they are? Where is your perfect explanation? Oh wait you don’t have one because all you have is opinionated based hate, not factual evedidnce in the Bible ! You are not the first one to come here and say this kind of stuff. You are trying to act as if you have some kind of authority or somehow you have obtained hidden knowledge. I’ll bet that sounds familiar, “Hidden Knowledge”. This is one of the major signs that you are in a control group! Here’s something else that proves you are in a control group, “Historical proof shows the Passover that Jesus established was abolished (325AD council of Nica )” your words. There is NO historical proof that the Passover was abolished! All you have is what this group has told you is proof. It is obvious, like so many before you, that you have not done any research on this. You have taken what you have been told and are regurgitating it to us. If you had done any research you would have discovered that this group has lied to you! They continue to lie to you, and the father of lies is Satan which is what they follow! How’s that for a perfect explanation!?! Factual evidence? Yes, I agree that you need some and I don’t say that out of hate or opinion. How about the six other feast you talk about? The ones that were supposedly written on the back of the tablets which the ten commandments were written on? You’ve already stated that Jesus sacrifice and New Covenant made the Law of Moses obsolete. That includes those supposed feast! Do you really need to be entrapped by these practices to feel like you have the truth? I don’t hate, I feel sorry for you. Sorry if you felt that your paragraph above was some kind of proof. There is so much more that you need to discover before you know the “TRUTH”. You can do it and I hope that you do. Research everything that you have been taught so far and most importantly do your research away from their influence! They have many years of manipulation practice and are very well versed in how to twist things to make them appear right. Just a hint for you, if what they tell you, share with you, and/or teach you makes you feel confused it’s probably your conscience telling you it’s wrong! God gave you that defense mechanism! Don’t ignore it! Good luck. Hmm, when one says Christ abolished Moses covenant/law, its kind of a misleading statement without exposition. Christ still wants us to follow the Commandments, which include observation of Passover, (something that instills God as absolute authority over your life, above earthly things or other religious ideas, or if you’d like to call them demons) it’s like reconfirming your faith, Passover. But Christ still followed the 10 commandments, he just uses a different priesthood of faith, as opposed to the levitical priesthood that the Jews still try to follow. Following the feasts have meaning in both priesthoods, and well the original Church of God did follow them, since it was still created from prior followers of levitical priesthood, and the feasts all transition over properly to New Covenant. Shadow and Reality is agreed upon by most christian denominations. So far, the only real problem with WMSCOG is what they currently believe about Ahnsonghong and what the concept of Mother God really means to them. As I was taught, New Jerusalem is what they consider Mother God, as Jerusalem gets married to Christ at the end of Revelation. Inside the church there are plaques called “teachings of Mother” but noone has tried to explain what that is, or tried to tell me there is some physical person that represents mother as Ahnsonghong represents second coming Christ. I don’t understand why they would call Ahnsonghong father in their Hymnals and prayers when Paul never referred to Jesus as Father. 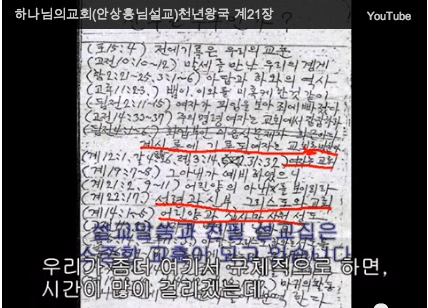 I’m still picking their brains to see if I truly see the truth in everything, but so far what they do on the community level is very tame and has basis in the bible/is consistent with the teachings of Ahnsonghong that Ive been taught so far. It seems obvious that you have not been as they say blessed with their hidden knowledge. In the forum there is a topic that talks about what really happened at Jesus last Passover. It is a wonderful beautiful story that the WMSCOG does not embrace. It doesn’t match up with their theory of god the mother. So far I imagine that you have been taken all over the Bible to select verses to support what they want you to believe. This is very dangerous and the best advice that anyone can give you at this point is to get out right away! This also is addressed by the WMSCOG early on when they tell you that others are going to try and take the “truth” away from you or try to tempt you away from the “truth”. This is a control mechanism! Don’t fall for it! You need to research for yourself, away from this groups influence, what is right. What really is the “Truth”! Their god the father, god the mother idea falls apart every way that they describe it. The forum has a lot of information about that as well. The topic is, “There’s no possible way there’s a god the mother”. Get away from this groups influence. Do your own research. Learn the truth and never look back!